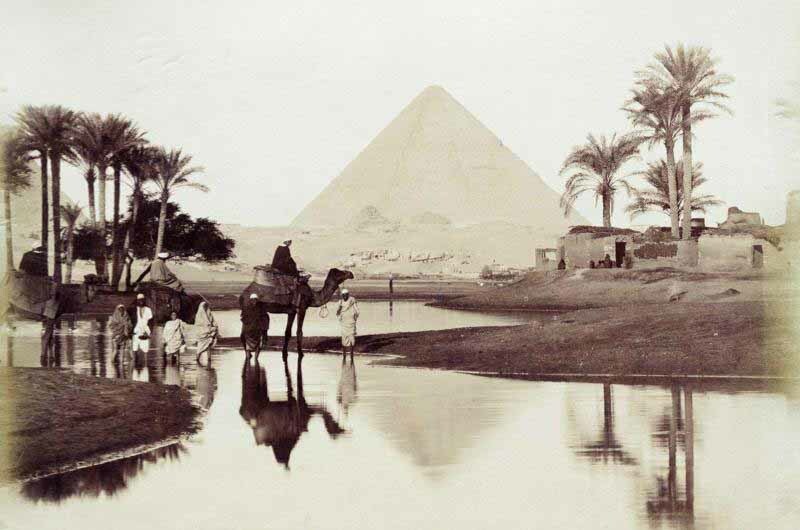 The Flooding of the Nile refers to an annual flooding cycle in Egypt that dates back to ancient times. Today it is celebrated by Egyptians as an annual holiday for two weeks starting August 15, known as Wafaa El-Nil. It is also celebrated in the Coptic Church by ceremonially throwing a martyr's relic into the river, hence the name, Esba' al-shaid ('The Martyr's Finger'). Ancient Egyptians believed that the Nile flooded every year because of Isis's tears of sorrow for her dead husband, Osiris. The three stages of the Egyptian flood cycle were Akhet, the time of the Nile flood, Peret, the sowing time, and Shemu, the time of harvest. Without this cycle people would die from starvation.The flood cycle was so predictable that the Egyptians even based their ancient calendar on it. Akhet was the first season of the year, between the months of June and September. Peret or the Egyptian Autumn season marked the time when their crops grew in the fields and were harvested, running from October to mid-February. Shemu was the third and last season of the Egyptian year which ran from mid-February until the end of May; it essentially signaled the spring season of the Egyptian calendar. Were it not for the Nile River, Egyptian civilization could not have developed, as it is the only significant source of water in this desert region. 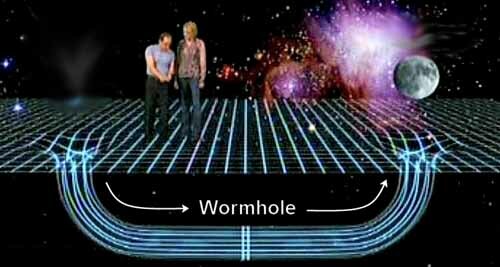 Its other importance was the fact that it was their gateway to the unknown world. The Nile flows from south to north, to its delta on the Mediterranean Sea. It would flood each year, bringing in silt-laden waters; when the waters receded the silt would stay behind, fertilizing the land,the silt would be helpful for growing crops. If a flood was to large it would wash over mud dykes protecting a village. A small flood or no flood at all would mean famine. A flood must be of just the right intensity for a good season. The ancient Egyptians did not realize that the flood in fact appeared due to rains on the mountains to the south, and it was seen as the annual coming of the god Hapi. The rains would swell the different tributaries and other rivers that joined to become the Nile River. In 1970, with the completion of the High Dam at Aswan, the annual flooding cycle in Egypt came to an end. Today, farmers must use fertilizers to keep their land productive, as the deposits of silt no longer occur each year. 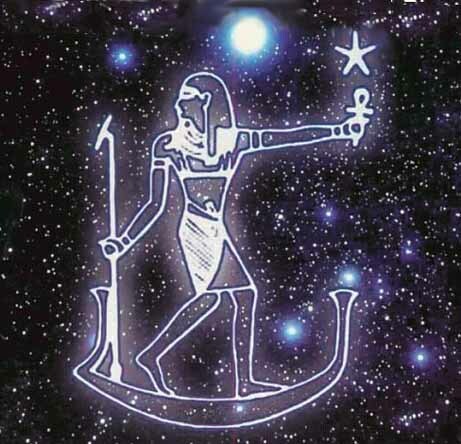 Sirius was a very important star to the ancient Egyptians, who called it the Star of Isis or the Nile Star. About 5,000 years ago, the helical rising of Sirius occurred earlier, around June 25. When the Egyptians saw Sirius rising just before the Sun they knew it would soon be time for the flooding, or inundation of the Nile River, around which all Egyptian life was woven. They depended upon the flooding of the Nile for the fertility of their lands. It was up to the Egyptian priests, who attended to the calendar, to sight the first rising of Sirius. At the ancient temple of Isis-Hathor at Denderah, is a beautiful statue of Isis, located at the end of an aisle flanked by large columns. The statue was oriented to the rising of Sirius and priests would place a jewel in the goddess' forehead so that the light from the returning star would fall on the gem. 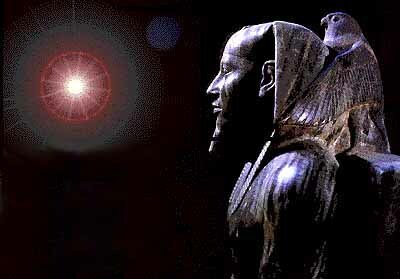 When the Egyptian priests saw the light of Sirius upon the gem on the statue of Isis they would announce to the people that the New Year had begun. 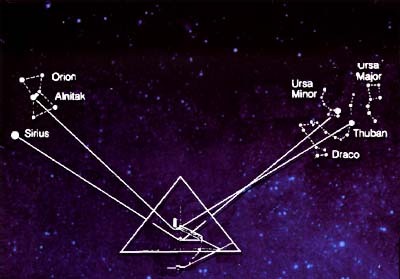 According to Lockyear, in 3285 BCE Sirius had replaced Draconis as the star marker of the Summer Solstice and the beginning of the Egyptian New Year. The star was used as an orientation point especially at Thebes and became identified with Isis. The Temple of Isis/Hathor at Dendera constructed in 700 BCE is oriented to this star through the northern opening of the central passage. On the temple wall is a zodiac square which shows the star. This is the period of time Sirius disappears from the sky - sequenced in the myth when Isis is hiding until the birth of her son, Horus - eventually the star reappears after Horus is born - resurrection. It is time. The first time each year in which Sirius appears is called the heliacal rising of Sirius. In Egypt this would be in the month of Thoth. It would occur close to the Summer solstice and the time of the Nile's inundation. The helical rising marked the beginning of the New Year which was held to be controlled by Isis. 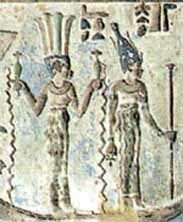 Sirius was revered as the Nile Star, or Star of Isis, by the ancient Egyptians. 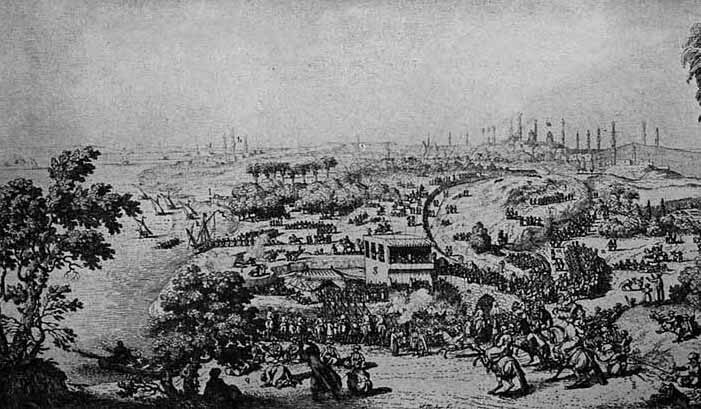 Its annual appearance just before dawn at the Summer Solstice, June 21, heralded the coming rise of the Nile, upon which Egyptian agriculture depended. This helical rising is referred to in many temple inscriptions, where the star is known as the Divine Sepat, identified as the soul of Isis. In the temple of Hathor at Dedendra, Egypt, appears the inscription, "Her majesty Isis shines into the temple on New Year's Day, and she mingles her light with that of her father on the horizon." For 35 days before, and 35 days after the Sun conjuncts it on July 4, the star Sirius is hidden by the Sun's glare. The ancient Egyptians refused to bury their dead during the 70 days Sirius was hidden from view, because it was believed Sirius was the doorway to the afterlife, and the doorway was thought to be closed during this yearly period. The dog Sirius is one of the watchmen of the Heavens, fixed in one place at the bridge of the Milky Way, keeping guard over the abyss into incarnation. The Dog Star is a symbol of power, will, and steadfastness of purpose, and exemplifies the One who has succeeded in bridging the lower and higher consciousness. Located just below the Dog Star there exists a constellation called Argo, the Ship. Astrologically that area in the sky has been known as the river of stars which is a gateway to the ocean of higher consciousness. The Arabic word Al Shi'ra resembles the Greek, Roman, and Egyptian names suggesting a common origin in Sanskrit, in which the name Surya, the Sun God, simply means the "shining one." In ancient Chaldea (present day Iraq) the star was known as the "Dog Star that Leads," or it was called the "Star of the Dog." In Assyria, Sirius was said to be the "Dog of the Sun." In still older Akkadia, it was named the "Dog Star of the Sun." In ancient Greece, Aratus referred to Canis Major as the guard-dog of Orion, following on the heels of its master, and standing on its hind legs with Sirius carried in its jaws. Manilius called it the "dog with the blazing face." Canis Major (large dog) seems to cross the sky in pursuit of the hare, represented by the constellation Lepus under Orion's feet. The concept of the mind slaying the real can be seen in the tales which relate the dog as the hunter and killer - the hound from hell. Another myth says Sirius is the dog given by Zeus to Europa, whose son Minos, King of Crete passed it on to Procris, daughter of Cephalus. The dog was presented to Procris along with a javelin that could never miss. Ironically Cephalus accidentally killed her with it while out hunting. Cephalus inherited the dog, and took it with him to Thebes, north of Athens, where a vicious fox was ravaging the countryside. The fox was so swift that it was destined never to be caught - yet Laelaps the hound was destined to catch whatever it pursued. Off they went, almost faster than the eye could follow, the inescapable dog in pursuit of the uncatchable fox. At one moment the dog would seem to have its prey within grasp, but could only close its jaws on thin air as the fox raced ahead of it again. There could be no resolution of such a paradox, so Zeus turned them both to stone and the dog he placed in the sky without the fox. The association of Sirius with a celestial dog has been consistent throughout the classical world; even in remote China, the star was identified as a heavenly wolf. There is a remarkable analogy in the Chinese double meaning of the word Spirit and the word Sing (star). The words for soul and essence in Chinese, Shin and Sting, are often interchangeable, as they are in the English language. It is said that the fixed stars, and their domain, contain the essences or souls of matter ... a living soul is a higher essence of matter, and when evolved may also be called a star. These stars and essences become gods. Like souls, stars are regarded as having divine attributes. Stars look down from regions of chaotic, violent, purity on the world of humanity and influence the energies of mankind invisibly, but most powerfully. The Chinese knew this place as the bridge between heaven and hell, the bridge of the gatherer, the judge. In the higher mind are gathered the results of the experiences of the personality. Between each life the soul judges its past progress, and the conditions needed to aid its future growth. As long as it is attached to desire, sensation, and needs experiences, it takes a body. The soul cannot pass over the "bridge" until it is perfected.